The new trend is to “reduce, reuse, and recycle”. Why not have fun while doing it… in fact, why not have a party?!? Gather some friends – along with their excess stuff – and have a fun evening of trading. 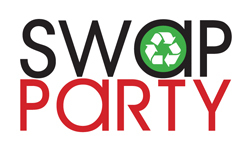 When planning this Swap Party, invite all your friends with similar interests. Eight people is a manageable number to invite, though anywhere from 3 to 20 is doable. Send out a fun Evite and give guests about two weeks to gather up their belongings. Plan on serving easy refreshments… something they eat and drink while rummaging through the treasures. Take turns shopping. Draw straws to see who shops first. Limit the number of items to three per turn to keep it fair and moving fast. Use Tokens. The host hands out homemade tickets (or poker chips work well) for every item a guest donates.If a person brings 10 items, she gets 10 tokens with which to purchase 10 items. Some larger items may be worth more (and cost more) tokens. Use post-it notes to show the cost of the big-ticket items. Keep the numbers even. Swap item for item. With this strategy, everybody goes home with the same number of items that they donated. If there are any items that no one wants to claim, offer to take them to a local Goodwill or charity of choice. Good luck and let the trading begin!